You are currently browsing the category archive for the ‘The Church and The Jewish Question’ category. Bonhoeffer studied for a year in New York City. The current ferment of American politics has brought comparisons to Europe in the 1930s, with echoes of leaders who stoke anger against outsiders and promise a return to greatness through the application of a strong man’s will. The analogy is hardly exact. Lacking the economic chaos and fragile institutions of Weimar Germany, America has fewer footholds for fascism. But the reaction to fascist darkness in the 1930s produced a figure, a bright light, who should guide us. Dietrich Bonhoeffer was a German theologian who resisted the Nazis and the influence of Nazism in his own church. He spoke out on behalf of German Jews, was implicated in a plot against Adolf Hitler’s life, was imprisoned, wrote and ministered for years from confinement, then was led naked to the execution ground and hung with a noose of piano wire, just weeks before the end of World War II. It is a question that could occupy a theologian’s entire career. Bonhoeffer’s was cut short at age 39. But it is worth noting one thing he did not find outdated. He believed that Advent and the story of Christmas speak directly to the modern world. In our day, when divisiveness is coming to be considered a virtue, we face a difficult challenge. Some people relate to others by emphasizing the differences between them while other people relate by emphasizing the commonalities. I suppose there is a time for each but of this I am sure: Those who live exclusively by the rule that our differences matter more than our commonalities will never receive the blessing Jesus pronounced on the peacemakers. He certainly had his times of clashing with the religious leaders who had so much to lose if they agreed with Jesus, but with the vast majority of people Jesus was amazingly inclusive. I am convinced — from watching Jesus and history and current events — that our first instincts must always be toward inclusiveness, toward cherishing our commonalities. We must at times be exclusive, of course, but let’s let the other person decide to be our enemy before we consider him to be an enemy. One of the current areas of great tension is the relation between Jews, Christians and Muslims. There are some very real differences between the three but we dare not neglect the deep commonalities. We who are Christian will never relinquish our center in Jesus Christ. Ours is a lifetime, unconditional commitment to Christ as Lord and Savior. But we must be very careful to avoid defending our borders, our edges as fervently as we do our center. We have a history, especially in America, of breaking fellowship with anyone who doesn’t share in the whole of our thinking. Conservatives, for instance, often seem convinced that those nasty Liberals aren’t even Christian at all. And those who baptize only adults sometimes look with scorn on those who practice infant baptism. Those who baptize by dunking tend to have little respect for those who drip a bit of water on the head. On and on we go, criticizing and separating from one another to form countless denominations and independent congregations. We seem to think the form of baptism, which distinguishes one group from another, is more important than our common commitment to Christ, which unites us. A Christian who traveled often to Egypt was asked once, “Is Allah the same as God or is Allah a false god?” The answer was emphatic: “Allah is not God.” What a profound misunderstanding! In the first place, the word “Allah” is simply the normal Arabic word for God. And the word “God” is simply the Saxon word for supernatural beings. In the second place, by “Allah” Islam means the Creator and the Lord of Abraham as portrayed in Genesis. Whether we agree with the Islamic interpretation of the story of God and his people, we cannot honestly deny that Christian and Muslim each intend to worship and serve the one Creator. Or, to think about the matter from a different perspective, read the story told about Jesus in the Gospel of Mark, chapter 7. Jesus has a fascinating exchange with an unclean, Gentile woman, someone about as low as one could get in the eyes of some people. They have a lively exchange in which she shows she is in perfect tune with Jesus. He grants her prayer and sends her on her way. He never once suggested that she should convert to become a Jew or even become his follower. He simply blesses and commends her. If Jesus did not insist that she become like him, who are we to insist that everyone else become like us??? Who was Dietrich Bonhoeffer? Pastor? Theologian? Activist? Professor? Martyr? Conspirator? He was all of these things, and more. The life of Dietrich Bonhoeffer provides us with an amazingly clear glimpse into the mind of a Christian who was faced with an impossible decision: to whom is loyalty due, Fuhrer or Christ? Bonhoeffer watched as fellow pastors and theologians bent their knees and proclaimed absolute loyalty to Adolph Hitler, and as the resistance of the church to the Reich in Germany gradually eroded, Bonhoeffer realized he could not stand by and do nothing. Given the opportunity by a brother-in-law who was an officer of the German military intelligence, the Abwehr, Bonhoeffer agreed to participate in the conspiracy that attempted multiple assassination and coup plots against Hitler. 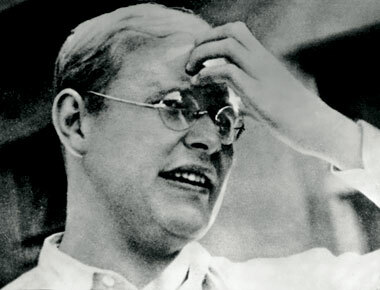 Ultimately, Bonhoeffer never attempted to justify his actions or the violence that the conspiracy planned. Instead, he accepted that his actions were condemned and only the grace of God could ever undue their power. He accepted the possibility of his own damnation in the hopes that millions could be spared the wrath of the mad dictator at the helm of his country. In the end, the plots failed and Bonhoeffer was imprisoned. For two and a half years he stayed in a series of Gestapo prisons and concentration camps awaiting the final verdict until that fateful April morning when he was marched naked to the gallows and executed. Bonhoeffer was many things, but his legacy continues to this day. His life and theology unlocks a dimension of Christianity that many assumed had been forgotten to the ancient past: martyrdom. Yet he was not simply a passive martyr that unquestioningly accepted his fate; he stood up for what he felt was right even though he could not justify his own actions.